I can’t count how many times over the past 25 years or so of my photographic career that I have really needed a higher tripod to photograph a scene. What is shown here is what I have found to be an answer for a higher tripod on an as-needed basis. My friend Bob Erickson, came up with this ingenious idea, which I took just a bit further. 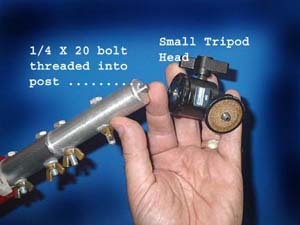 Bob’s original idea was to add paint roller extender poles to the legs of a tripod by means of strapping the poles to the tripod legs with bungee cords. Using these low-cost paint roller poles, available at most hardware stores, almost any tripod can be made into a giant 10 foot or even 15 feet of higher tripod. This gives your tripod super long legs for very little money, since the extender poles don’t say the word “photography” any place on them. To make a better connection of the pole ends to the tripod legs, I went one further by pulling off the screw-on male fitting for the paint brush. Then, into the metal tubular pipe, I inserted a round metal post that will also slip into the end of a tripod leg. 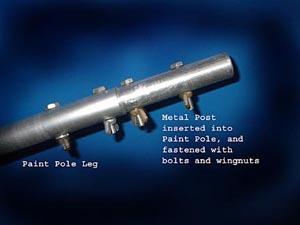 Then all that is needed to make a secure connection is to drill some holes through the legs, extender poles, and metal post, and insert some bolts with wing-nuts to tighten them together as one solid piece on each tripod leg. 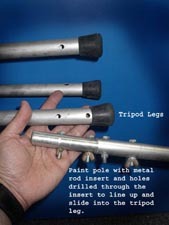 The addition of rubber crutch tips found at a drug or hardware store will help to keep your new legs from slipping. My tripod now goes up so high, I have yet another problem; nosebleeds from the altitude! 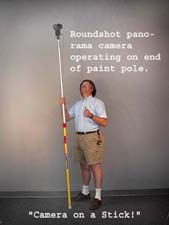 The paint poles may be used for other things besides making your tripod taller. I have found that one of the most useful things to be done with the paint pole is to simply drill and tap into the end of one of the metal pole inserts a ¼” X 20 thread bolt. Get a bolt and screw it tightly into the newly treaded hole, and even add a spot of glue if you wish. Now cut off the head of the bolt and file the end smooth so that it will again screw into a bolt hole. Once this bolt end is sticking out of the end of your metal post, which has been inserted and secured into the end of your paint pole leg, you can attach a small tripod head to the pole. Now you will have a pole that has a tripod head to attach any camera you wish for a super high vantage point over the crowds of people at any event. I call this my Camera on a Stick. This arrangement is also quite useful for extending your camera way out the window of a tall building. The camera on a stick can also be used to dangle your camera under a helicopter for a full circle aerial view.